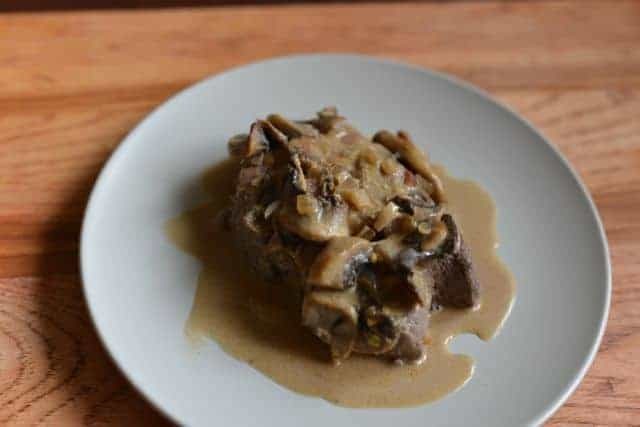 This steak is a combination of Steak Marsala and Steak Diane. I have always wanted to make Steak Diane but I didn’t have all of the ingredients that I needed. So this recipe is a happy accident. I used Marsala instead of the brandy that most steak Diane recipes require. If you have never had either recipe this steak is quickly seared in butter, then shallots are added. Then a creamy rich sauce is made with wine and finished with Dijon mustard. The result it a perfectly cooked steak with a creamy rich sauce. While I made this recipe with tenderloin you could easily do this steak with sirloin, rib eye, or even chicken breasts. If you are going to use chicken breasts you must cook the chicken thoroughly. Be sure to serve this steak with something that will soak up the extra sauce. Mashed potatoes, rice, or even buttery noodles make a nice addition to this steak. Love chicken Marsala? You can prepare steak Marsala in the same way. Pat steak dry with paper towels and season with salt. Allow steaks to rest at room temperature for 15 to 20 minutes.Melt 1 tablespoon of butter in a large skillet over medium-high heat. Add the meat and cook for 2 minutes on the first side. Turn and cook for about 30 seconds on the second side. Add shallots and cook for approximately 30 seconds. Remove steak and place on a plate. Cover the steaks with another plate so they stay warm. Add sliced mushrooms and cook until they are soft. Tilt the pan towards you and add the Marsala. Tip the pan away from yourself and ignite the Marsala with a match. (Alternatively, remove the pan from the heat to ignite, and then return to the heat.) When the flame has burned out, add the mustard, cream, butter, and Worcestershire sauce. Serve sauce over steaks. Garnish with minced parsley leaves. Made it last night and it was a huge hit. Very good!!! Made this with my parents a few days ago with filet mignon and it was one of the best things I’ve ever eaten! Really nice sauce! One of those things that makes you sit back and savor the moment. Looking forward to trying it with veal (or pork) cutlets. I have tried and tested over a dozen marsalas, Lombardo is the best hands down for this Recipe. I think this sounds incredible. A must try. Please let me know how it turns out for you.